A comprehensive history concerning the discovery of gold, the founding of Columbia, the early-day miners, settlers and merchants. Stories and legends of this famous Gold Rush Mining camp which is now one of California’s premier State Historic Parks. Of all the towns in the Mother Lode, Columbia is the one which can best return you to the days of the Gold Rush. Though only a small fraction of what it once was, the town contains the best collection of Gold Rush architecture anywhere in the world. Evenings or early mornings are the best times to visit, when no one is around to distract the imagination. Walking along the quiet streets, the buildings have many stories to tell for those willing to spend the time to listen. Containing current photos and historic images, this is a wonderful history/guidebook for visitors to Columbia: the Gem of the Southern Mines. Available for purchase through 1849’s ebay store. Click here. An informative look at one of the nicest towns in the Mother Lode. This book details the early days of Sutter Creek, its famous mines and citizens. Suffering serious fires in 1862, 1865, 1870, 1875 and 1888, the damage was always quickly repaired, because gold never sleeps. It’s always working, or creating work, causing things to happen. It caused this town to boom, to build, to prosper and to last. It’s responsible for the many buildings and homes here that have survived from the 1800’s. They were built well, built to last, because they thought the gold would last. And as it turned out, it did, although in a slightly different form. Lumbering, and more recently, tourism, now provide Sutter Creek and much of the Mother Lode with its gold today. If you enjoy antiques and fine restaurants, Sutter Creek is the place for you. Current photos and vintage images detail the many historic buildings to be found in town, making this a great history/guidebook for visitors to Sutter Creek today. Available for purchase through 1849’s ebay store. Click here. The third book in the popular “On the Gold Dust Trail” series examines one of the premier gold camps of the Southern Mines, Mariposa. The book focuses on the founding and history of the town, its early miners and settlers, and the remaining historic structures left for travelers to visit today. In addition to being the county seat, Mariposa is also on the main road to Yosemite National Park. Thousands of visitors each year enjoy strolling the historic streets of Mariposa and investigating the mining and other places of interest in the nearby areas. Historic images as well as current photos and a town map provide an excellent guide for both first-time visitors and locals alike. Sixty-two pages of information on Mariposa, the Gateway to Yosemite. Available for purchase through 1849’s ebay store. Click here. The fourth book in the “On the Gold Dust Trails” series focuses on one of the most important Gold Rush mining camps in the Northern Mines, Auburn. The history of the early days, the founding of the town, the early settlers, the gold strikes and gold busts. The story behind the beautiful county courthouse that is unmatched throughout California. The streets in Old Town Auburn follow the contours of the hills and gullies, some are steep, many are narrow, and most wind and twist through the hills, allowing for some confusion to a first-time visitor. The best way to get to known the town is to park your car and walk. Most of the old brick buildings that were built during the 1860’s are still in use today, so go inside and look around a bit. This history/guidebook is the perfect reference for today’s modern-day Argonauts. All the information one might wish to know about the days of gold in Auburn. Available for purchase through 1849’s ebay store. Click here. Being a Concise History & Table of Distances concerning the Historic Mother Lode Mining Camps Located on and about HIGHWAY 49, The Gold Dust Trail. Showing the Route from Mariposa in the South to Sierra City in the North, together with Remarks on Side-Trips, Excursions, & Points of Interest. A handy booklet for travelers visiting the California Gold Rush Country. Fits easily in a top shirt pocket or in the back of your jeans. Makes a great checklist of mining towns to visit, and includes maps of the Northern and Southern Mines. Available for purchase through 1849's ebay store. Click here. 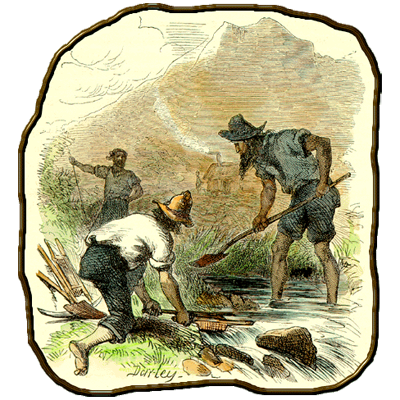 A collection of historical Gold Rush illustrations, recreated as a series of modern day postcards. 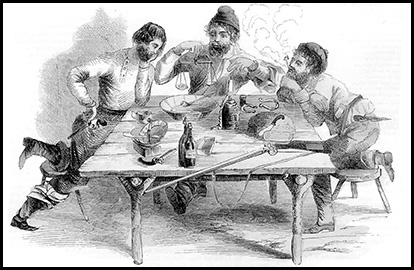 The series consists of 20 different black and white images printed on standard size (3-1/2” x 5-1/2”) postcard stock, and are ready to be written and mailed, or kept as a souvenir of the California Gold Rush. These cards make a great visual aid for kids working on a California Gold Rush project, usually part of the 4th grade curriculum. Available for purchase through 1849’s ebay store. Click here. The California Gold Country: Highway 49 Revisited is a combination History/Travel Guide/Coffee Table/ Picture Book devoted entirely to the old mining camps of the California Gold Rush; their founding, early-day settlers, and legendary gold discoveries. It is a 235-page, over-sized, hardcover book which has been out of print for many years. The introduction describes James Marshall's discovery of gold, Gold, Gold! on the South Fork of the American River back on January 24, 1848. We learn how the news spread (such a discovery could never be kept secret), first across the nation, and then around the world. The result of that news? 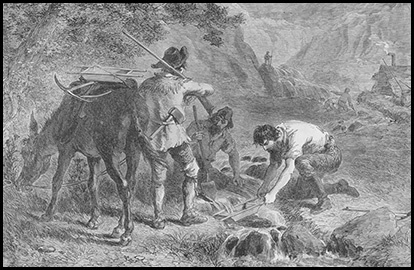 The California Gold Rush, one of the greatest mass-migrations the world has ever seen. 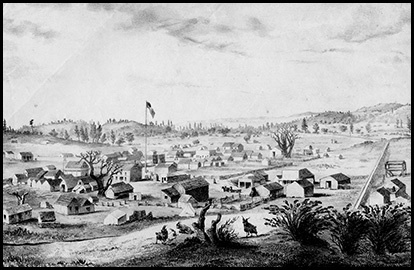 Next follows the main portion of the book, which details the history of California's Gold Rush mining camps, specifically, those which have survived the years and still contain historic sites for travelers to visit today. Old buildings, foundations, stone walls, mining evidence & artifacts, monuments, gravesites, markers....anything of interest from the days of old, from the days of gold. Because these are the things which give the old mining towns their romance and charm, their attraction and lure. These are the things which can transport us, even if only for a moment's imagination, back in time to the days of forty-nine, when anyone could strike it rich. To help visitors find these golden links to the past, some 266 up-to-date, full-color photographs of the old buildings, relics, and mining sites are provided, along with directions on how to find them. Also included are 65 historic images from the 1800's, courtesy of local museums and historical societies, which provide us with an interesting window to times long past. 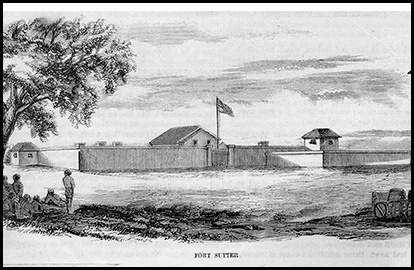 Other sections of the book include: Brief biographies of famous Gold Rush citizenry; a hand-drawn map/checklist sketching the route of Hwy 49 and locations of the mining camps; a bibliography of sources used; and a complete index for readers searching for information on specific towns, individuals, or enterprises. The California Gold Country: Highway 49 Revisited was the culmination of ten years of effort, which included countless research trips throughout the Gold Country, interviews with local citizens and historians, several hundred rolls of film, writing, editing, reviewing by local experts, re-writing, raising funds, and finally self-publishing the book. It sold through both its first and second printings and is currently out-of-print with no indication that there will be a third edition. Less than a handful of signed, First Edition Hardcover copies are available for sale. They are in new condition, shrink-wrapped with inlaid map and personally signed by the author. If you would like one of these collector items, they are available on 1849’s ebay store. Click here.